Rabbit Pet: Funky Pies are made without meat! AND they Help Rabbits & Other Animals!!! 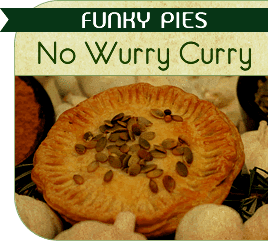 Funky Pies are made without meat! AND they Help Rabbits & Other Animals!!! Thank you Angie for those amazing Funky Pies you had delivered to The Rabbit Sanctuary today!!! We needed the extra energy and taste sensation today with all this rain we are having. Funky Pies are Planet friendly, eco-funky foods freshly made and baked at Angie's Bondi Café. Looking on their unreal website I can see that you can buy these amazing pies fresh or frozen, retail or wholesale, in store or online.